Ann O’Rourke is the primary contact for Ear Spray. She tried to use effects on her percussion for quite a while, which did not work well (acoustic percussion is very loud and you can’t hear the effects very well). Her last percussion was with cymbals, which she loved, especially long sounds by rubbing implements on her cymbals. But, she wanted to have more variety of sounds. Finally, in January 2017, Ann started taking cello lessons (her favorite string instrument), She started with “classical” cello training with a teacher, Michael Graham, in Oakland CA, a classical cellist. Soon after she started her cello lessons, Ann told her teacher that she was not sure where she was going but definitely wanted to play cello with Ear Spray, which meant louder sounds and effects. Her first “gig”, a few months after starting cello lessons, was at an annual meetup of her teacher’s adult students. She did a demo of doing percussion on an acoustic cello plus a bit of humor. See it below. She soon realized that amplification and effects were not very loud with the acoustic cello, and purchased an electric cello 6 months later (NS Design). Also, she was not planning on playing any structured music, such as songs. The first time she brought her electric cello to a lesson, her teacher loved it. Then she added effects, first with a Boss GT-100, but she did not like the effects. Then she started using her Korg Kaoss Pad, which she purchased in 2008 and tried to use on her percussion for awhile. It was fantastic on the cello!! 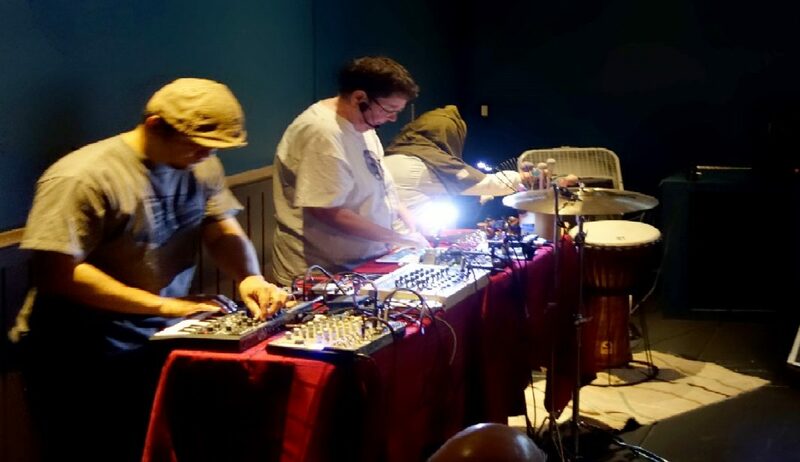 At first gig with Eurostache (a local experimental music group) in July 2018, she alternately bowed and used various found objects (toilet brush, rocks, etc.) and her drum sticks and implements on the body of her cello. finally she had amplified percussion sounds and effects. In Jan, 2017, Ann started taking classical acoustic cello lessons. In June she purchased an electric cello (NS Design) so she could play louder and use effects. She started doing experimental/noise. Her first Ear Spray gig was 10/8/17 at Norcal Noisefest. Her cello teacher, Michael Graham in Oakland CA really liked the electric cello sound, the use of implements on the cello (rocks, sticks, etc.) that she used in percussion, and her multi-effects box. In late 2014/2015 she started doing videos for some or all of all the groups at music events. She has done videos for Godwaffle Noise Pancakes (not recorded), at BrutalFX, and the San Francisco Fog Music Festival. Ann does live processing of video samples – 100% improvised along with the alive music being played!! In the late 1980s, Ann spent several years taking classes in documentary video production and did a few short documentaries. She really liked editing but the equipment was too primitive and very tedious. She quit doing videos and re-started in 2010 using iMovie. Fantastic, very easy editing! She recorded every Ear Spray performance since the first one in 2010 and posted them on youtube at http://www.youtube.com/annorourke12. She was very pleasantly surprised to find out how easy video production was with personal computers. She had a Macbook Pro with iMovie and very quickly learned how to use it. Since all her videos were posted on youtube, “quality” was not a big factor for the first few years due to severe limits on video size. After year or so youtube started allowing larger and larger videos. Now she can post Ear Spray’s full performances in HD. In June, 2013 she decided to start using video projections behind her group. There were many, many projector options and software options and it took her several months to figure out what she wanted. Video processing software was completely new to her, so it took her awhile to figure out what she wanted to use. She didn’t want to lug around a computer, so she uses an app, touchviz, on her ipad air.the developer also did touchosc, very popular app for connecting a computer to an ipad or iphone (or android device). Fortunately, she knows how to do video production so doesn’t have to learn it also! For three months in the fall of 2013, she attended a weekly free jazz jam session in Berkeley, CA. She did vocals and practiced her videos. Many thanks to the musicians who put up with her videos when she was first learning how to use the software and projector! Ann studied science in her undergrad days and almost all her videos are science related – microscope, space, plants, meterology, etc. They are heavily modified with effects, of course!! Video projection, percussion, effects and vocals at the same time. Yow!! In early 2013, Mark Pino, a second percussionist, made multi-tasking a lot easier. Mark could take over most of the percussion when Ann was fiddling with her mixer and changing effects plus vocals and some percussion. Ann O’Rourke is a “natural” free improvisor. She can sing and play in Western time, but finds it very restrictive. Ann is inspired by graphic scores, birds, plants, etc. She also gets- ideas when playing with other experimental/improv musicians. Like many people, Ann O’Rourke had “traditional” music training. In high school she learned to read music and sight-sing a capella Gregorian chant in her church choir. She went to a small Catholic high school in Oklahoma where there was no band program. She played instruments when she was young by herself – clarinet and cornet. Her first instrument was a cornet in high school. It took her 6 months to pay off the “layaway” at a local pawn shop and start playing. She was self taught, using a book and later played clarinet. After college, she moved to San Francisco and took flute lessons at the San Francisco Conservatory of Music. But, she never got to play with others and quit playing instruments in her mid-20s – job, marriage, etc. Ann loves having a melody “instrument”, her voice. About 6 years ago, she took classical vocal training from a local opera singer and got a new voice. She has been singing ever since. She has taken several classes and workshops for improvising vocals from free improvising vocalists Jay Clayton and Annette Giesriegl. For three years she performed with the Cornelius Cardew Choir, an experimental/avant garde vocal ensemble. Before she joined the group, she had never heard of Pauline Oliveros, Terry Riley, etc. It was a great way to learn about that type of music – by performing it!! She has a “traditional” music background, starting with singing in the church choir and playing cornet in high school. She later played clarinet and flute. Much later she started playing drumset and took drum lessons for 5 years and played in rock and jazz groups. Before discovering experimental/imrov music over 5 years ago, Ann was a jazz drummer playing jazz standards in small jazz combos. When she first started learning jazz “comping” (putting in random notes, in time) with her left hand on the snare drum, she wanted to play random notes (not in time) with both her hands and feet. She tried doing this “free” improvisation: while “trading fours” (drummer and another player alternate 4 measures of improvisation). Of course, this was just too weird for jazz, so she finally gave it up. In early 2010, she saw a flyer about a monthly “free jazz jam session” at a local music school. She was a “natural” and played free jazz for about a year, but found it too restrictive. Ann kept wanting to use found objects and non-traditional instruments, use effects on drums and cymbals, and do weird vocals. Most of the time she played drumset for other musicians and she played solo for about 10 minutes. doing her weird stuff, at the free jazz sessions. In August 2010, she met Carlos Jennings, an electronic musician, and they formed Ear Spray. Their first performance was in August, 2010 at Skronkathon, an annual all-day local music “festival”. The first time Ann played drums was in a drum circle near Santa Cruz, CA in 2004. It was a magical experience. It was outside, at night. There were about 10 people playing lots of different hand drums. Someone would start a beat and others would start playing. Then someone else would start another beat. Different beats were played at the same time. There was also chanting. She loved it, but it was too far away to regularly attend and there were no similar groups where she lived. She learned to play djembe and sometimes plays it today as it is small and easy to carry. After playing hand drums for awhile, Ann picked up drum sticks for the first time. 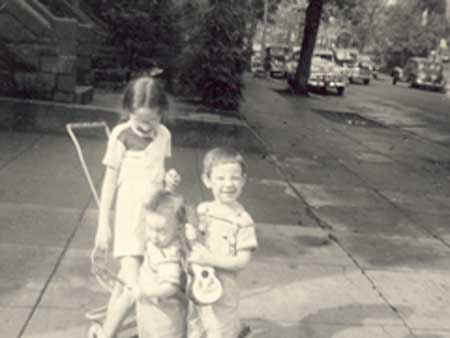 Her three brothers had been playing rock music together for many years. 10 years ago, she decided to finally go to one of their jams and brought a tabourine to play. There were two drummers. Her nephew, one of the drummers, had too much to drink and sorta slid off his drum stool. Ann picked up his drumsticks and played a simple steady beat. She was hooked and soon started taking drum lessons. She took drum lessons and practiced an hour a day for five years. She played/jammed with her brothers and occasionally with rock and jazz groups and singer songwriters. Fortunately, drums are like riding a bicycle – muscle memory! When she was young, her voice was not very good. She was put in the back of the church choir in high school. So, she never did any other singing. About 7 years ago she got mad because her brothers never would let her sing. She took classical voice lessons from a local opera singer and got a new voice. It took about a year, but finally she was able to sing in her “upper” range and had a much better voice for her lower (alto) range. In 2009, Ann attended Jazz Camp West, an annual, long-running music event (about 8 days long) at a Boy Scout camp in the Santa Cruz mountains for adults. She had discovered improv music earlier in the year, but had paid for the camp, so she went. One of the vocal instructors was Jaye Clayton, a very famous improv singer who sung with the free jazz players in the 1960s. She also took drumming classes. She realized that her “calling” was to do drums and vocals at the same time. Singing and playing drumset is very, very hard. As she started playing found objects and fewer drums and cymbals, it was easier. At Ear Spray’s first performance in 2010, she did both.